Been diving in Sharm El-Sheikh? Please Vote! 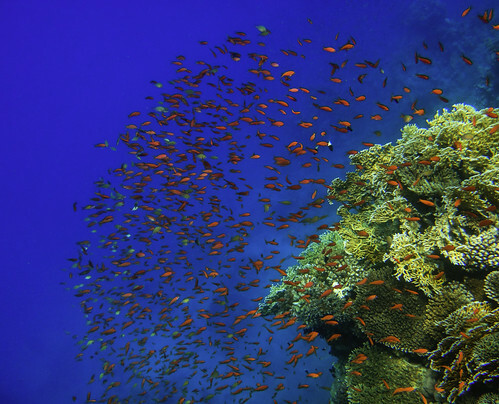 Anywhere you dive in Sharm el-Sheikh is likely to impress – there are a number of well-protected marine national parks teeming with exotic and colourful reef fish, while both soft and hard corals thrive in the region. Known as one of the best wreck dives in the world, the SS Thistlegorm is a massive 128 meters of sunken history reaching as far back as 1941. The transport vessel was travelling from Glasgow in Scotland to Alexandria in Egypt when it was bombed by German bombers and has now been added to Egypt’s already impressive list of diving opportunities. Explore below more details about scuba diving in Sharm El-Sheikh. Ras Mohamed is the ultimate in diving destinations and has officially been a protected marine national park since 1993. Divers can expect to be impressed by the stunning underwater scenery that abounds at the many Ras Mohamed dive sites. Drift dives, coral walls and pinnacles all await and are regularly visited by large pelagics such as trevallies, jacks and barracuda. Turtles, white tip reef sharks and even hammerhead sharks enjoy these nutrient rich waters around the well-known Shark and Yolanda reefs. Yolanda Reef offers an interesting log book entry as the freight ship went down in the 1980s carrying its cargo load of bathroom marchandise. Everything from toilets to sinks can be seen on the sea floor. Named for an underwater cameraman and well-known Sharm dive instructor known as Bob Johnson, Ras Bob is a sheltered site made famous by a Cheltenham & Gloucester advert for pearls. The site offers far more than can be seen in the advert though, with caves, overhangs, bays and gullies just waiting to be explored. Underwater photographers should look out for menacing-looking crocodile fish and majestic blue spotted stingrays that often hide out on the sandy sea bed. One of the most exciting dives of the lot in Sharm el-Sheikh is the drift dive known as Jackson Reef. This reef is one of four large reefs that resemble underwater mountains in the Strait of Tiran, known for its exceptional drift dives. Divers will be swept along by the strong current at a rapid pace, but with plenty of time to take in the abundance of marine life and magnificent walls covered in soft and hard corals. The battle scars still remain on this silty, well-preserved underwater giant and most of the now-rusted cargo is still present. The ship was carrying ammunition, radios, motorcycles, rifles and a number of armoured cars and trailers, all of which make for a very interesting dive that is highly acclaimed as one of the best wreck dives in the world. Other wrecks worth exploring are the Dunraven Wreck and the Rosalie Moller Wreck. Diving is possible throughout the year and divers usually opt for no thicker than a 7 mm wetsuit when the water is at its absolute coldest at 22°C. During the summer months of June to September, a 3 mm wetsuit is more than sufficient for the warm waters averaging 28°C. Some visitors cannot withstand the high outside temperatures in summer which frequently rise above the 40°C mark. For many divers, the best time to visit Egypt is around October and November when the weather is cooler. Htere is a large number of Dive Centres in Sharm El-Sheikh, making it easy to organize a day trip dive safari or a longer Red Sea liveaboard. A number of award-winning dive centers and training facilities are available in Sharm el-Sheikh and many of them offer attractive packages to entice entire families to try diving, blow some bubbles and join a diving course. To avoid the masses and explore some of the most famous as well as the lesser-known dive areas, dedicated divers often choose a liveaboard holiday experience to get the most out of diving in the Red Sea. Feeling inspired and ready to dive the Red Sea? Check out our Sharm El-Sheikh travel guide and start planning your next diving trip! We both are qualified divers. We wondered whether you have a diving exchange program, like an accommodation exchange? We can help in any part of the hotel, restaurant or diving centre. We are planning on doing this around January 2018 and we would like to stay around a month. we hope through this exchange to learn more about diving and have a wonderful experience. Currently I am working as a sales assistant and David is a head chef of a restaurant. David and me have travelled as backpackers for a few months in India, we possess strong crisis management skill also we like to deal with people, especially in foreign cultures. Additionally, our experiences enables us to be quick problem solvers, effective communicators, and strategic thinkers. We especially enjoy working and thriving in a fast-paced environment. we believe our experience and our skill sets are a perfect match. A copy of our resumes are enclosed for your reference. We would welcome an opportunity to discuss our qualifications with you and learn more at your earliest convenience. Thank you very much for your time and consideration. My name is Chun-Chi Tsao and my partner is David Hooson, we both are qualified divers. We wondered whether you have a diving exchange program, like an accommodation exchange? We can help in any part of the hotel, restaurant or diving centre. We are planning on doing this around January 2018 and we would like to stay around a month. we hope through this exchange to learn more about diving and have a wonderful experience. We would like to dive at Ras Mohammed at least 1 day, and at some nice other places the rest (maybe the 2 days at Ras Mohammed? What do you suggest us?). What do you offer us, keeping in mind our limited days? Hello, My name is Zoran and I will be is Sharm el sheikh on february 28th. I would like to book a thiselgorm wreck dive. I am padi advanced diver with nitrox. i have over 80-100 dives since my certification. My last dave was this past weekend. I live in Florida usa so diving is a weekend hobby. since I am traveling lite, I will need to rent a full gear. i cam bring my own mask. I will be at Sharm El Sheikh at Hilton Sharm Waterfalls Resort Hotel and would like to spend my time mostly on dives; I would like to dive from 26.08 till 30.08 and would like to take night dive also. I am AOWD with 50+ dives, last dive in August 2018 in Greece. Can you please send me your proposal? I need full equipment and from/to hotel transport if far from hotel. I have own diving computer. We are 2 divers looking for a club and a place to sleep. we are planing to stay in Sharem for 2-3 days, and to dive 2-3 times per day. what packeges do you offer? Ich werde mit meinem Freund ab den 21 bis 28.09.18 im Lido Hotel bleiben und würden gerne mindestens ein mal pro Tag mit Ihnen tauchen gehen 🙂 Ich wollte noch zusätzlich PADI Advance machen (mein Freund hat schon den Zertifikat). Could you send me a list with all your prices? Specially winter packages. I will be coming to Sharm next january, so I am looking for a diveclub. I will be staying at the Stell di mare for one week, and go diving for 4 or 5 days. We arrive Monday at lido hotel and we want to dive! Do you have a Price List and Information about the dive Spots? I cannot open this site on your homepage. So I would appreciate to get some information. I would like to dive with you in July. Please, send me a 5 days package price. We are 3 friends and we are going to Sharm El Sheikh in 12 days. We are looking for a dive center there. We are 1 advanced adventurer, 1 open water diver and the last one has no license. Is it posible to dive with you on 27th and 28th of april? Can u give me price for these 2 days? Can u also give me price for a open water course?